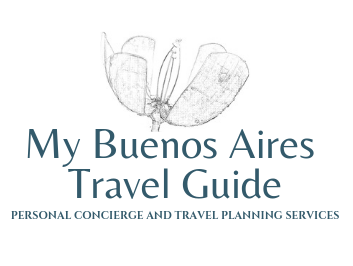 I take pride in offering the most personalized and dedicated Travel Planning and Concierge Service in Buenos Aires, helping visitors in the organization of their trips to Buenos Aires and other destinations in Argentina and bordering countries. My approach is totally personalized, which ensures the planning of the best customized trips, as noted by many of my satisfied customers on their testimonials for more than 10 years now. For a very reasonable fee, I will provide all my expertise to help you make your trip memorable, from planning a customized itinerary and finding the right accommodation, to making reservations for a number of exciting and exclusive tours and special activities (see Tours & Activities section). I will help you plan the perfect trip to any of the wonderful destinations in Argentina, like Bariloche, Mendoza, Iguazu Falls, Patagonia, or the North West, as well other countries in South America such as Uruguay, Brazil, Chile, and Peru. Flight tickets, hotel reservations and excursions are provided and managed by one of the leading incoming Travel Agencies in Argentina, with my permanent coordination. All the trips will be customized according to your particular interests, schedule and budget. I can help in the selection and reservation of the best hotels in Buenos Aires and other destinations in Argentina, according to your budget and level of comfort desired, from Luxury to mid-range, and including some of the most charming boutique hotels. Staying in an apartment is one of the best ways of knowing a city. But searching for an apartment for rent is a time consuming, exhausting task. It is also hard to make a decision without knowing the different locations, especially in a city like Buenos Aires, where every neighborhood has its own features and character, noisy streets and unsafe areas. I can do the search for you, according to your needs and preferences. As a local, I know which the best locations are. After a careful selection of the best apartments available that suit all your requirements, I will send you their details so you can decide. I will save you hours and hours of searching on internet. • Reservations for City Tours, Day trips and other special activities in Buenos Aires (click on the Tours section above to see all the options available). • Airport and city transfers with private vehicles and the most reliable drivers. • Help obtaining Tickets for concerts, festivals, theater plays, opera and ballet performances, sports events. • Restaurant reservations and VIP access to the most exclusive nightclubs in Buenos Aires. • Appointments and Recommendations for: English speaking Nannies and Babysitters; Makeup and beauty sessions; Spanish Lessons. • Special services for handicapped visitors. • Organization of private meals with a Personal chef at your apartment. • Logistics for Family reunions / bachelor parties / weddings. • Mary Institute and St. Louis Country Day School, Saint Louis, USA. Groups of exchange students 2014, 2016, 2018. • TV show production "A Place In The Sun US" - Season 1, Episode 12, Buenos Aires. • American Bar Association - Section of Dispute Resolution. Buenos Aires Meeting 2017. • Long Beach Symphony Orchestra. • The Elephant Story. Texas, USA. • And VIP executives from other International corporations. For references, please read My Customers' Feedback or their Reviews on Tripadvisor and other online sites.